Whether you are a novice or and old pro when it comes to digital photography, it is always nice to have a place to share resources. ShutterBudd is that sort of community. Whether you want to evaluate how various pieces of gear work for you, talk about photo manipulation software or just share some of your work, this is a great site to frequent. This community is active in both digital and analog mediums, so you are as likely to find information about the newest Digital SLR camera or medium format black and white photography and everything in between. 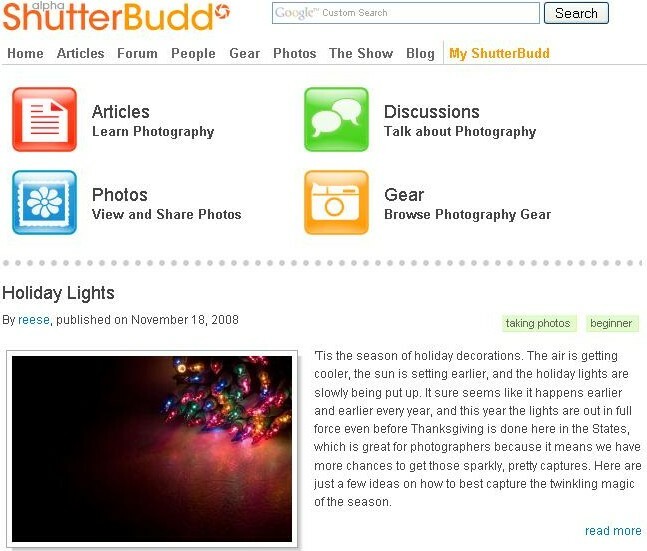 While other sites such as Flickr, SmugMug, and Picasa allow you to share photographs and make connections, ShutterBudd is a smaller community that feels closer knit. ShutterBudd has ventured from the cyber world into the real world with their photo exhibitions that take place around the San Francisco Bay Area. There is still time to submit your photos for the January 2009 show which features the theme: Good Food, Good Friends!